They come at you in waves, all long arms and full hearts. There are zombie invasions less relentless than Kelvin Sampson’s University of Houston basketball team. Just when an opponent thinks they’ve neutralized one of Sampson’s difference makers through foul trouble or ineffectiveness, another one comes popping off the bench. Still, Cincinnati coach Mick Cronin, the latest unhappy victim, bristles at the notion that this now 23-1 UH team is doing this without a true star. 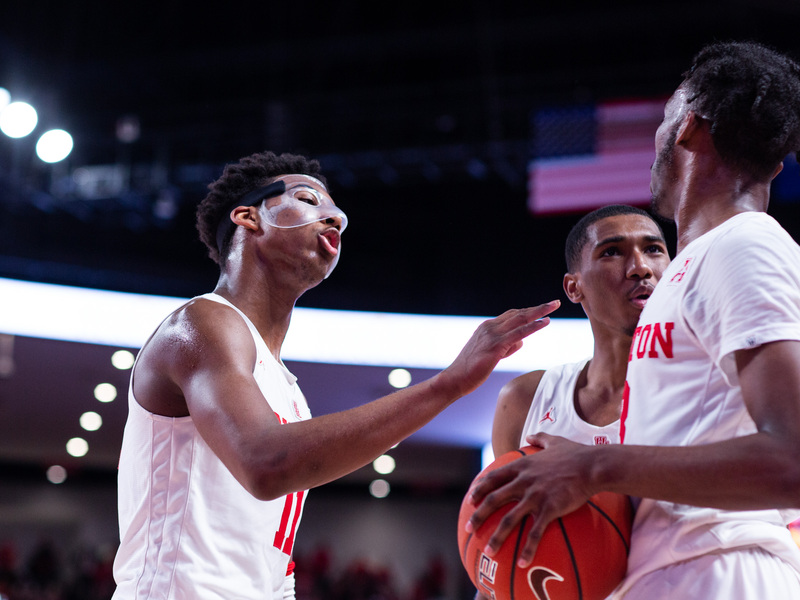 Davis Jr. may be a star hiding in plain sight, but there’s no missing the overall power of this Houston team that has more wins than all but two teams in college basketball (only Gonzaga and Nevada can match UH’s 23). By Monday afternoon, Houston will join the Zags and the Wolf Pack in the Top 10, coming in at No. 9 in both major polls. That’s what comes from a rather workmanlike 65-58 win in the first game in Houston in which a ranked Cougars team faced another ranked team since 1984. Even Marty McFly might hesitate to go that far Back to the Future these days. Sampson and his guys — and they’re all Sampson’s guys molded, toughened and steeled under the defensive crucible that this 63-year-old basketball lifer demands that his practices be — aren’t just waking up the echoes of Phi Slama Jama though. They’re bringing a city to college basketball life. There is another sellout Fertitta Center crowd, roaring with glee as UH holds No. 25 Cincinnati scoreless for the last 6:11 of a close, who-wants-it-more, game. Heck, there is Chris Paul sitting in the front row on the baseline, having decided to spend his Sunday afternoon taking his daughter to a University of Houston basketball game. Paul is given a No. 34 Houston jersey — the number that Hakeem Olajuwon himself wore — and if you don’t see some happy symbolism in that, you’re missing the fun. Tickets to UH basketball games, ducats practically given away many years, are suddenly a hot commodity. If this keeps up, serial bandwagon jumper Drake will be soon asking for directions to Houston’s campus. The hidden star and UH’s bench mob have been building this all season, piling up wins like they’re bricks in some great basketball wall. Really, Sampson’s been constructing and envisioning this type of team ever since he arrived on campus and realized seven was not enough. Now, Sampson has a bench full of problem solvers and issue erasers. While Davis and Armoni Brooks (last year’s sixth man) play 33 and 32 minutes as starters, no one else in Sampson’s 10-man rotation logs more than 22 minutes against Cincinnati. This is how you overwhelm as a team. They can also beat you with their reserves. Call emerging sophomore guard DeJon Jarreau the sixth man or the sixth starter if you want. Jarreau — who may be one of the skinniest players that Sampson has ever willing played (“DeJon won’t be 212 when he’s 60 years old,” the coach cracks) — does not care. As long as you call on him. The game against Cincinnati is only three minutes and 22 seconds old before Sampson is inserting Jarreau into it. Jarreau, who started almost the entire season as a freshman at UMass, seems to be getting used to this instant impact maker role. After all, Sampson has him in there at winning time — and this pencil of a player will outscore Cincinnati 11-5 by himself after the Bearcats take a 53-52 lead with 8:05 remaining. Jarreau often looks like the best player on the floor against Cincinnati, but he’s not close to alone. Nate Hinton, playing through a broken nose and the Hannibal Lecter style mask required to protect it, makes a late defensive switch from Sampson look like a masterstroke. Hinton, the freshman who is every bit as built as Jarreau is slight, holds Cincinnati star Jarron Cumberland (27 points) scoreless for those crucial closing six minutes, using his size to harass the big guard. Cedrick Alley Jr. hits two threes and finishes at plus 11 in 18 minutes. Chris Harris Jr. (the Cougars also may lead the nation in Jrs.) hits all three of his shots and blocks two Cincinnati shots in 18 impactful minutes. Brison Greshman swats four shots in only seven minutes of court time. Up and down the Cougars’ bench, difference makers keep appearing. This is how you get to 23-1. A star hiding in plain sight — and plenty of help. To Sampson, this is how you build a program with staying power too. You develop your bench, commit to it, knowing that these players once considered question marks will be next season’s starters. This 23-1 Houston team that’s seven wins away from potentially finishing the regular season 30-1 is just getting better and better because its players are growing more and more. Sampson refuses to put a ceiling on his bench squad — and now the ceiling for this American Athletic Conference team that no one was talking about in the preseason just keeps rising. Today, the Top 10. In March, who wants to play them? For when you play Kelvin Sampson’s UH team, it sometimes feels like you’re playing against an endless, surging mob. Even zombies stumble over or get thwarted by a plant sometimes. Sampson’s guys? They never stop coming. And they’re bringing UH’s basketball history and the city with them.